As a philosopher, I think that you can help me with a conundrum. You mentioned that the “wax model” attributed to Plato is erroneous, and that he (Socrates) did not subscribe to such a model. However, I keep coming across it in my research regarding memory and oblivion. I’d be grateful for any clarification you might offer! I wouldn’t worry about it, since what you’re suggesting about Plato is fine for your purposes. 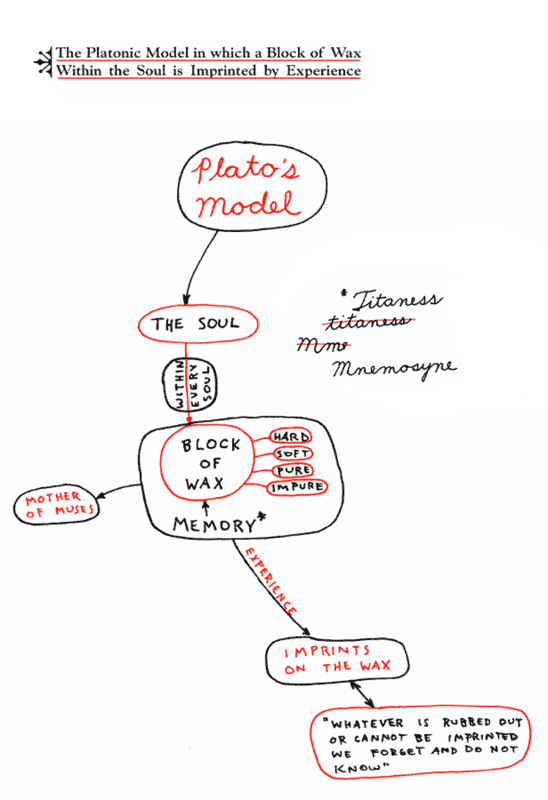 Plato does indeed consider a model of memory as a wax tablet in the mind, blank at birth, on which the senses plant impressions. He does this in the dialogue _The Theatetus_ in the course of trying to figure out what knowledge is. But he criticizes and rejects this model, and replaces it by the model of the aviary, which he also criticizes and rejects. He finally offers a third account of knowledge, but finally rejects it too, and the dialogue ends without arriving at a conclusion. His actual view of knowledge and the mind, from the dialogue _The Meno_ on, is that genuine knowledge is of the Forms, and is present in the mind at birth, but has to be retrieved by a process of recollection–the so-called docrine of recollection. Much later Locke does adopt the model of the mind that Plato considers and rejects, of the mind as a “tabula rasa” or blank slate at birth, on which the senses inscribe ideas (this blank slate is usually taken to be wax in Locke too). But as I say, I don’t think it makes any difference for your purposes, since even though he rejects it in the end, Plato does indeed describe and consider the blank wax slate model.